Deliver health services and information to more people. "Mosio has helped our company deliver healthcare information to those who need it most." Patients and healthcare providers are looking toward mHealth technology for a future of more accessible, comprehensive healthcare. 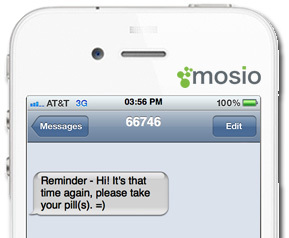 Mosio's 2-way text messaging communication technology helps health organizations extend their outreach to patients using their preferred method of communication. Our software receives their text messages and lets you respond by typing on a secure website, keeping patient data safe. Mosio's mHealth solutions provide efficient, effective ways for health professionals, counselors and information specialists to communicate with patients via text messaging and mobile web services. No hardware to buy or software to install. Manage all of your health services in a single web-based interface. 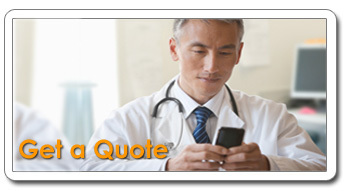 Patients seeking health information and services text questions from their mobile phones to your organization. Your health specialists respond via a website interface, providing real-time 2-way conversations. Additional info such as links, mobile web surveys and click-to-call numbers can be sent with ease. Mosio’s Mobile Platform has SSL encryption, the same security feature used in online banking. The platform also gives you the ability to choose for users to be viewed by phone number or by Anonymous Patron ID. Phone numbers are never shown in the Anonymous view, and message history is stored only under the ID. Mosio technical staff are trained in security management best practices by the company's Security Officer. All Mosio employees and support staff are trained about privacy sensitivity and will only share data/information with approved client account administrators, as needed. Mosio contractors do not have direct access to sensitive client data and any contractor development work goes through an extensive code review before being uploaded to our platform, databases or systems. Patient reminders, notifications, and tips are provided via text message. These alerts can be automated on a schedule, sent in mass numbers, or written individually. They can be combined with TextChat, giving patients the ability to respond and engage in interactive conversations using their mobile phones. Alerts are available in nearly all Mosio Plans. Surveys can be completed via SMS or mobile web page, and are used for services such as pain management, health diaries, and patient satisfaction. Surveys can be combined with Reminders and TextChat to offer a full communication package. Contact us to get a quote to discuss how Mosio can help you achieve your health service goals by deploying text message surveys to a bigger set of the population. We will work with you to implement our messaging platform into your existing patient management software or to implement additional mobile solutions to augment your text messaging services.